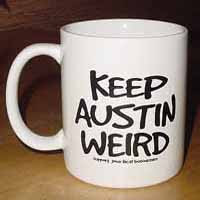 The Official Thomas Bickle Blog: I Love You Austin! Update: I did find out who the instigator was. She is a "delegated" friend - a friend sent to us by a farther-away friend. I am suprised and not surprised by her thoughtfulness; the first time we met her, she babysat Thomas while we tried to have the "What Now" conversation with the doctors after finding out the worst news. I will be thanking her biweekly for the next couple years. Also, I wanted to say that Thomas is having a great week or so. He was very sick with his Not-the-Flu sickness for so long that we started to think it was The Decline that we've been holding our breath against. But we're not there yet. This week, he's feeling much better. There are discernible changes, but the big Thomas News of the Week was him finally catching some air while jumping, something he's been working on for a month. I mean, I've always loved Austin, a lot. I'm not sure who the instigator is, but I woke up to a Paypal account filled with a LOT of small donations that added up quickly. You are padding my If-I-Need-to-Stay-Home-from-Work account in a serious way...and giving us a little wiggle room as we adjust to Scott having quit his evening job (Thomas's needs becoming too unpredictable).